In his Poetics (ca. 335 BC), Aristotle defines tragedy as “an imitation of an action that is serious, complete, and of a certain magnitude…with incidents arousing pity and fear, wherewith to accomplish its katharsis of such emotions…”. He goes on to list six elements of tragedy, arguing, for example, that the plot (mythos) of a good tragedy should always involve the protagonist’s descent from good fortune into bad — a descent that often involves a mistake (hamartia) he or she makes. Indeed, it is this descent that at once frightens and saddens the viewer, for, in it, an important aspect of the human condition is illuminated. As Alexander Pope famously put it, “To err is human.” Thus the tragic is never far from our lives. Theater allows us to confront that reality and, through the purging of our emotions (katharsis), provides an opportunity for renewal. 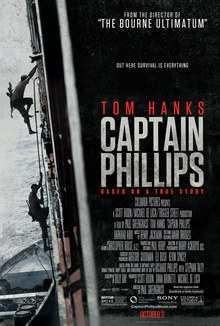 Understood in these terms, Paul Greengrass’ latest film, Captain Phillips, might very well be considered a tragedy. As the film begins, we meet Captain Richard Phillips (Tom Hanks) — a veteran New England seaman, who is readying to helm the Maersk Alabama, a cargo ship, from Oman to Kenya. It is, to be sure, a dangerous journey. The route has been targeted by Somali pirates of late, and, as Phillips’ wife ominously notes, there is no accounting for such violence. But Phillips decides to go anyway. He has a family to provide for, and he hopes that, if safety protocol is followed, the ship will make it around the Horn of Africa and on to Mombasa. What else can he do? The perils of life cannot avoided. In this way, Phillips is set up as the classic everyman — a quality further brought out by Hanks, who, of course, has made a career out of playing such characters. We understand Phillips’ trepidation, even as we understand why he assumes the risk. After all, we make the same kinds of choices everyday — the late night walk home, the flight to London, the drive up the New Jersey Turnpike! Hence, when the pirates do come, led by the fearless Abduwali Muse (Barkhad Abdi), it is just as Aristotle predicted: we fear for Phillips just as, deep down, we fear for ourselves. His story represents the tragic’s inexorable presence in life. It is a theme that Christians have long struggled with. In Book III of his Confessions (ca. 397 AD), St. Augustine laments his love for theater in general and for tragedy in particular. As he points out, tragedy encourages one to love sorrow, rather than redemption. Moreover, it focuses on the suffering of a character, rather than on the source of suffering in every human life — namely, sin (a word also rendered hamartia in Greek). Much could be said both for and against Augustine on these points. What is certain is that he would be concerned, and perhaps even appalled, by the ending of Captain Phillips. In a scene that may earn Hanks yet another Oscar, a blood-spattered Phillips registers the terror and shock of coming face-to-face with death. Greengrass sugarcoats nothing, and he does not give us the satisfaction of seeing what happens next. We are left with the tragic, alone.